Pie are squared, or 2πr. Did you all have a Merry Christmas, Happy Kwanzaa and/or Happy Hanukkah? I had an excellent holiday, & since Jay worked both Christmas Eve & Christmas Day, I got a third day of celebrating in yesterday on the 26th, filled with awesome gifts & copious amounts of food. And since our holiday celebration with Jay’s family has yet to be had, there’ll be yet another day of fun & gift-giving to come in January. Which is nice, it’s good to break up the monotony & boringness of January with an enjoyable event. Especially since once the hustle & bustle of the holidays & Christmas dies down, & I’m no longer being kept busy with that, I’ll feel the sadness of the losses I’ve experienced in 2011 far more poignantly once again. Ah. Such is life. So back before Thanksgiving, when I found out what the plans were/whose house it would be at & I was figuring out what to make & bring, I had a plan. My plan was that I was going to make two pies, hence the title of the post. Why was I going to make two pies, you ask? Well, a few reasons. One- I had recently acquired two new pie plates; one gorgeous Lola-pink 9″ pie plate from my wonderful friend Brianne (who sells Longaberger, the makers of the aforementioned pie plate which is no longer available in pink) and another beautiful eggplant-colored pie plate from Michael’s that I got for an obscenely low price. So low I won’t even tell you because you’ll hate me. But you see, the pink pie plate was important. It was especially important that I show it off properly. I ordered this cute little basketweave pink pie plate back in like, May or June, and I waited for it until October 30th… patiently. It was limited edition, immediately retired, the shipment was delayed & it was back-ordered & whatever else. And then it finally came & Brianne ever-so-kindly delivered it to me during a time when she was a bit otherwise preoccupied (her new house in Connecticut that her, her husband, her 3-year-old & her almost 2 month old newborn baby had literally just moved into was slammed by the freak October snowstorm & lost power for days). So this plate was a major thing for me. The other pie plate is lovely, and is a gorgeous color with a fluted ruffly edge, but it doesn’t match Lola or my website, so it doesn’t have as much significance. Anything that matches Lola is a must with me. My kitchen is not a masculine place, hah. Plus, being it was part of their breast cancer initiative, Horizon of Hope, & my mom is a survivor, the pink color has double significance. Reason two for the pie dramatics: I like pie- not really fruit pies, but chocolate, Shoo-fly or creamy ones; like coconut cream, chocolate cream, etc. Those are the kinda pies I can get diggity down with. Just me, a pie, a fork & some whipped cream. And reason three? Because I have a ton of pie recipes that I’ve never made. For example, Nigella Lawson’s Girdlebuster Pie. Tell me you aren’t intrigued by the title alone! And there are tons more, some of which are very traditional, some not so much, and others slightly too complicated for an everyday pie. But nonetheless, I had these two pretty little pie plates & I so desperately wanted to use them. That said, I had all intentions of making two pies for Thanksgiving. But alas I did not. And why not? Because this one pie that I tested out in the few days before turkey day was so simple yet so amazing I couldn’t bear to make another. What was it? Maple syrup pie. MAPLE. SYRUP. PIE. 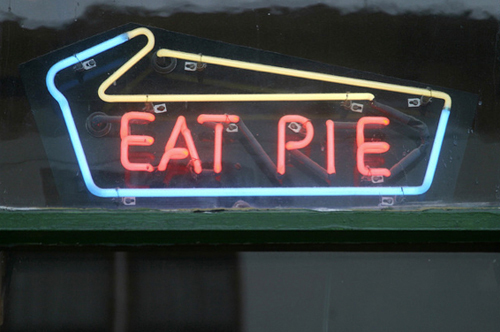 Read it again: maple syrup pie. Thanks to that book by Patty Pinner that it came from, my pie-making life was changed. Seriously. This pie made me rethink my non-pie-making self. It took no time at all and yet there it was, smelling all fantastic &… maple-y. Like a Shoo-fly pie but maple. I’ve made some things from the book before (namely a lemon ice cream that was so creamy & delicious it was like frozen lemony perfection) but this is just… so crazily simple & yet so delicious. I just don’t even know. But… *sigh* …unfortunately, the pie didn’t photograph well, and didn’t last very long either, admittedly. It did taste like sticky, sweet, gooey heaven on a plate. However… it just didn’t look very good in pictures. Actually it looked downright awful; kinda poo-ish. And I used the eggplant colored pie plate, so it was all kind of dark. If you’re a blogger who takes pictures of food you know things like shoo-fly pie, pecan pie, chocolate frosting & chocolate cookies are the hardest things to photograph well. Especially in bad lighting, and my kitchen sadly has horrid lighting. And on top of that, like I said, it definitely didn’t last long enough for me to attempt another photo shoot in better light. So I was on to my next (& newer) plan: another pie. I didn’t know what kind, yet, but I just knew I’d have to use these pie plates for something photogenic & post-able! And so Halloween came & went. Then I made the maple syrup pie, then Thanksgiving passed, & no more pie. Two batches of cupcakes instead. Then it started to inch closer to Christmas, and still no pie. Cupcakes, gingerbread cookies, brownies, etc… but I still hadn’t found the perfect pie. I kinda stopped looking for one in all the holiday hubbub. The pie plates looked more & more lonely every day. 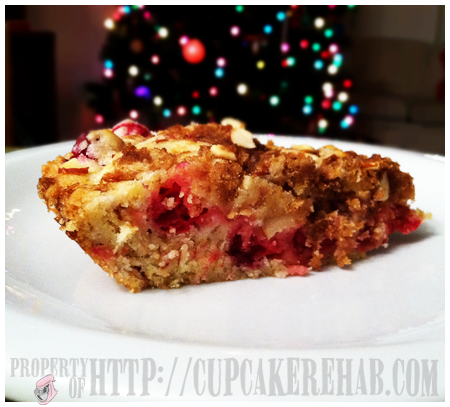 And then… crustless cranberry pie came into my life. They say you find it when you’re not looking. Whatever “it” is. See back before Christmas, Rosella, a friend of mine who I’ve known since freshman year of high school (which is far longer ago than I’d like to admit) had me & my mother over for coffee with her & her mom (& Rosella’s one year old baby, Giovanna). I know Rosella so long I remember when her niece was Giovanna’s age. I know her from back when we wore spike bracelets to school, when she dyed her hair green in her mom’s white bathroom sink & we “borrowed” her parents’ Infiniti to go joyriding a few too many times. I could mortify us both by posting a picture of us way back then but I won’t. 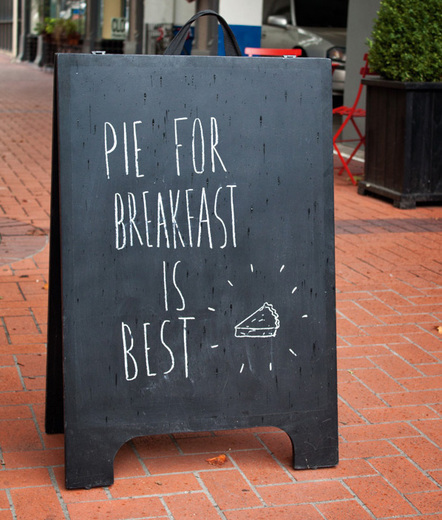 And anyway, we’re talking about pie. So we all got together & Rosella served this crustless cranberry pie. Wow. SOLD. And I don’t even like cranberry. Forreals. 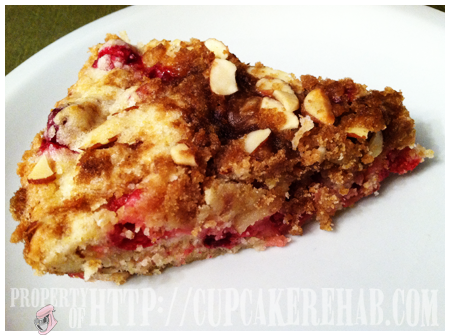 Cranberry, almond, streusel… it was like a berry crumble-type thing. Like a coffee cake. Made in a pie plate. And it was so good. So that night I asked her for the recipe & she told me it was from AllRecipes.com! So I downloaded the app immediately. My faith in recipe websites has been restored. Preheat oven to 350° degrees F. Grease one 9″-inch pie pan (or 8″ x 8″ glass baking dish). Combine the 1 cup flour, white sugar, cinnamon and salt. Stir in the cranberries and half the almonds, and toss to coat. Stir in the ½ cup melted butter, beaten eggs, vanilla and almond extracts. 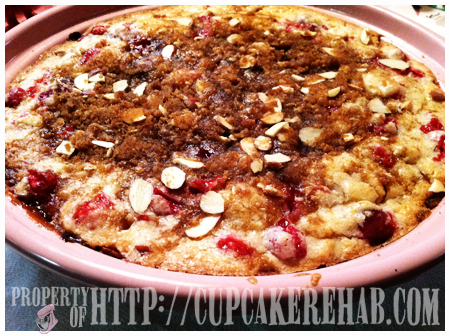 If you are using frozen cranberries, the mixture will be very thick. Spread the batter into the prepared pan. In a small bowl, mix the 2 tablespoons flour, 2 tablespoons softened butter, brown sugar & ¼ cup almonds together to make a streusel-like topping. Sprinkle mixture on top of pie. Bake at 350° degrees F for 40 minutes, or until a wooden pick inserted near the center comes out clean. This would be great with fresh blueberries in the summer, too. Or raspberries, or blackberries, or even chopped strawberries… with a bit of lemon zest. Totally adaptable. The original recipe calls for walnuts, but I took the advice of the commenters & went with almonds since that’s what Rosella did with her version, so if you prefer walnuts then that’s okay too. It’d probably be great in any capacity. I can even see it with a spoonful of fresh berry jam on it, or vanilla ice cream. Served warm or room temperature, with coffee, tea or cranberry ginger ale, it’s fantastic any way you like it. I scaled back the amount of cranberries from two cups to one, because I felt like one cup was just fine. Feel free to add the full two cups. But even if you don’t, and you end up with a practically full bag of cranberries, you can make tons of other neat cranberry stuff- amaretto cranberry sauce, pomegranate cranberry sauce, cranberry muffins (this recipe would work excellently in muffin form), cranberry bliss bars, etc. Or even make a second pie. I mean, this is a pie you can have for breakfast. It’s true- I had it for breakfast, around 10 a.m., that day at Rosella’s mom’s house. It’s a dessert, it’s a breakfast, it’s a pie, it’s a cake. It’s everything. 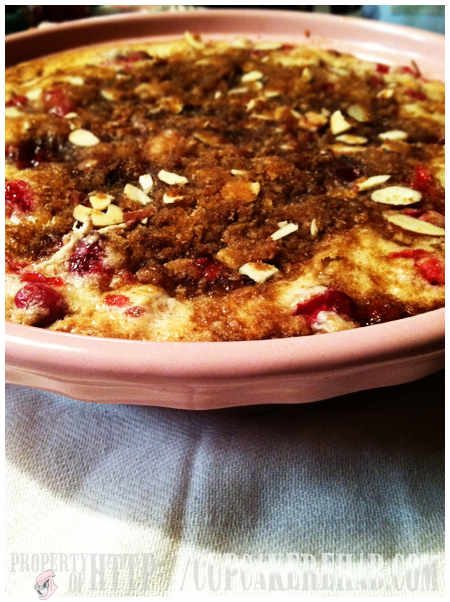 So really, where have you been all my life, crustless cranberry pie? The dish that made me like cranberries. Sorta. I’m still not big on them, but this pie definitely made me rethink my almost 30-year long cranberry strike. I made it for my “second Christmas” yesterday & it was a massive hit. And in my beautiful pink pie plate! Squee. Best of all? This one was extremely photogenic. And I’m no master pie-maker, I’m totally more a cake-girl than anything else, but because this is more like a coffee cake you don’t have to be a master pie-maker! No pesky crust, no bothersome filling. Easy as 1-2-3. You don’t even have to make it in a pie plate. But when you have such a pretty one like I do, why not? Clearly the mathematical reference in the title is purely for satirical reasons. I failed math one semester in high school, it shames me to say. I got a whopping 35 on one of my math regents. I’m not bragging, and I am certainly not proud of it. I can’t help it though, I use the other side of my brain. I got a 90 on my History Regents, an 88 on Chemistry and a 92 on English. But you give me a math equation involving numbers & my mind shuts off. This doesn’t make baking difficult at all, though, because of a bevy of apps that provide me with the exact measurements & equivalents that I need, if I should need them (most of them I have memorized by now). I never thought I’d say it but my iPhone has made my life considerably easier, thank you Jay. So yes, I know the term 2πr, and that it means that the radius squared multiplied by pi (π) or 3.14 or 22⁄7, equals the circumference of a circle. However that’s where my knowledge ends. Don’t even ask about my problems with the Pythagorean Theorem. I was pretty decent at truth tables but linear pairs? Forget it. Yes, I pity my future children too; they will be seeking math homework help from the internet. Or iPad apps. But that’s okay, because they will be so insanely excellent in History & English they’ll really frighten you. As well as correct your grammar. So really, I did make two pies. Just not at the same time, and nowhere near the same type. Pie(s) are squared. Next Post A toast of champagne. I have a question: would it work without almonds or nuts altogether? I have some family with nut allergies but I’d like to try this. Could I substitute maybe dried fruits or something else? I love this blog by the way! I don’t see why you couldn’t omit the nuts. If you use two cups of cranberries you probably wouldn’t miss them at all. Maybe add a little lemon zest? Let me know how it works! Useful information. Fortunate me I found your site by accident, and I am surprised why this accident didn’t happened in advance! They are very convincing and can definitely work. Nonetheless, the posts are very short for starters. I would like to take the opportunity of saying thanks to you for your professional advice I have usually enjoyed browsing your site. entire preparation would never have been complete without consulting your blog. came upon till now. However, what concerning the conclusion? Are you certain concerning the supply?